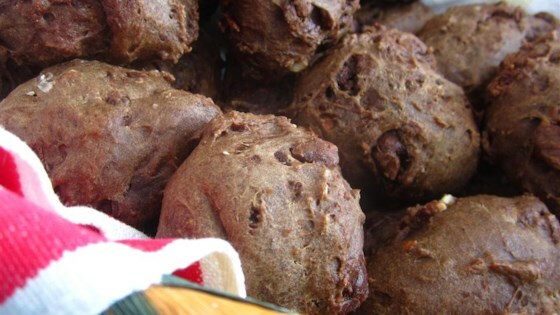 "This is sometimes known as meatball cookies. A must in our family at Christmas. Feel free to cut recipe in half. I usually bake about 150 dozen cookies at Xmas time to give away in cookie trays." Preheat oven to 350 degrees F (175 degrees C). Grease cookie sheets. In a medium saucepan over medium heat, combine the butter and milk. Cook until melted, stirring occasionally. Set aside to cool. In a large bowl, stir together the flour, sugar, cocoa, baking soda, cinnamon, nutmeg and cloves. Stir in the milk mixture by hand until the dough is firm and not tacky. Mix in the chocolate chips and walnuts. Roll the dough into 1 1/2 inch balls and place onto the prepared cookie sheets. These cookies do not spread much, so you can place them fairly close together. Bake for 20 to 25 minutes in the preheated oven, until firm. Remove from baking sheets to cool on wire racks. Glaze with a thin confectioners' icing when cool to preserve freshness. These are missing something. If you like hard chocolate bread like cookies then give them a go. just like grandma used to make! very good. I wanted something unique so when I found this I was excited. Not quite perfect, a little bit too much like bread, but overall good flavor.